This is a collection of thoughts, quotes and teachings on Holi festival in Hinduism. The messages are mainly of Swami Jis and are based on Hindu religion teachings. One of the great obstacles in life to our spiritual progress is the difference between what we do or say on the outside and how we really are on the inside. Holika had performed certain austerities by which she was entitled to this boon from God. On the outside, she was pious. But, on the inside she was not pure. Prahlad, on the other hand, was a simple, pure, loving devotee of God. This is what saved him. This inner purity and inner piety is what truly save us, what truly make our lives divine. So many of us go to temple, do the rituals, offer money to the priests, and chant a certain number of prayers. Then, we go out and act in selfish, impious, dishonest ways. All the rituals and puja in the world cannot make up for the lack of piety, honesty and compassion. The goal of going to temple is not just to perform rituals; the goal is to become spiritual. God is happier with pure, innocent, devoted Prahlad than with all the austerities and rituals performed by his father and aunt. On Holi we chant: Holi I, Holi I, Holi I…. However, let us not just chant this rhyme; rather, let us truly pray to God that on this day “I” may become holy. Let us pray that “I” may become pious, pure and devoted as Prahlad. In that way our lives and our hearts and our souls will be forever protected, forever sheltered at His holy feet. As we chant “Holi I, Holi I, Holi I….” let us also pray that our “eye” may become holy, that we may be granted the divine vision by which we behold Him in all whom we see. Let us pray that through our holy eye, we never are led toward anger, greed, lust or jealousy. Let this Holi be a time when we change not only the color of our faces, but the color of our hearts. Let us not only play holi, but let us become holy. Let the only color that truly penetrates our beings, be the color of god. For, on the morning after Holi the other colors will wash away. But we must let the color of god be indelible in our eyes, in our ears and in our hearts. As we play Holi… let us also pray that our “eye” may become holy, that we may be granted the divine vision by which we behold Him in all whom we see. 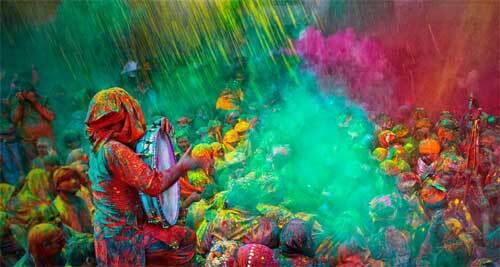 Holi, the festival of colors, is another seasonal festival associated with Hinduism. At this time, everybody splashes colored water or powder all over each other. It is wonderful because it reflects exactly what is occurring in nature at that time – when all the beautiful flowers of different colors are blossoming. By celebrating this event we feel a greater oneness with nature. This splashing of colors was also a famous ‘lila’ in Shri Krishna’s life. All great Hindu festivals have religious, social and hygienic elements in them. Holi is no exception. Every season has a festival of its own. Holi is the great spring festival of India. Being an agricultural country, India's two big festivals come during the harvest time when the barns and granaries of our farmers are full and they have reason to enjoy the fruits of their hard labor. The harvest season is a festive season all over the world. The religious element in the Holi festival consists of worship of Sri Krishna. In West Bengal and Orissa it is also called the Dol Yatra. The word dol literally means ‘a swing’ An image of Sri Krishna as a babe is placed in a little swing-cradle and decorated with flowers and painted with colored powders. The pure, innocent frolics of little Krishna with the merry milkmaids – the Gopis of Brindavan – are commemorated. Devotees chant the Name of Sri Krishna and sing Holi-songs relating to the frolics of little Krishna with the Gopis. The social element during Holi is the uniting or ‘embracing’ of the great and the small, of the rich and the poor. It is also the uniting of equals. The festival teaches us to "let the dead bury the dead". We should forget the outgoing year's ill-feelings and begin the New Year with feelings of love, sympathy, co-operation and equality with all. We should try to feel this oneness or unity with the Self also. Holi also means ‘sacrifice’. Burn all the impurities of the mind, such as egoism, vanity and lust, through the fire of devotion and knowledge. Ignite cosmic love, mercy, generosity, selflessness, truthfulness and purity through the fire of Yogic practice. This is the real spirit of Holi. Rise from the mire of stupidity and absurdity and dive deep into the ocean of divinity.